The Arch Essentials Kit (Arch-E) for MODO enhances your arch-viz workflow via a set of handy, custom-built tools. Six re-mastered plugins from the popular mARCH arch-viz kit. Three, artist friendly, endlessly tweak-able window generators. Early access to beta/experimental tools; e.g. Door Templates. This is the most valuable tool in the mARCH Classics kit and is a real time-saver. It sweeps a single polygon profile along a path of points and creates an extrusion that has mitre-type joints at each point or junction along the path. A highly tweak-able plugin that reproduces a wide range of window designs. Ideal for arch-viz, interior visualisations and set extensions. A super handy tool that enables you to interactively scale geometry, in one or mesh item layers, based on a single known length or by a multiplication factor or by bounds. In addition, choose to centre the geometry around the world origin and/or rest it on the ZX ground plane. Centering one or more mesh layers around the world origin, either individually or grouped. Moves all the geometry within a mesh item (at the component level; no item transforms) from a source point to a target point or the world origin. Allows per-axis alignment using novel tool handles and supports modo's 'select through' workflow. Anytime you wish to align one mesh to another along one or more of the major axes. Selects all geometry that matches the height of a pre-selected vertex, edge or polygon. In addition, this command enables the selection of geometry within a range of heights, as well as, selecting all geometry above or below the height of a selected vertex, edge or polygon. Checking elements of your model to ensure they are positioned at the same height; e.g. walls, floors and window reveals. Selects all polygons whose normal matches that of a previously selected polygon, and permits refinement of the selection based on a variety of filters; e.g. you can limit selection to polygons in the same plane as the target polygon. Creating a polygon selection prior to applying materials, projecting UVs and more. Align a selection of points to the last selected point, along one or more axes, with a given amount of offset. 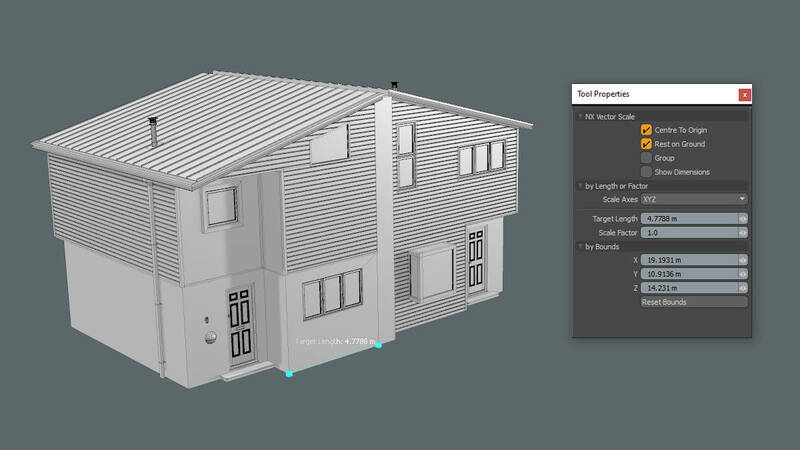 This tool supports multiple mesh item/layer selections and is designed for use with modo's fast 'Select Through' workflow; Hence, you can change your point selection on the fly and align different pieces of geometry whilst this tool remains active. Moving the end of a piece of steelwork or trim to a target position. Generates 2D arch and half-arch shapes (polylines or polygons) that can be extruded or swept (path or radial) to create 3D geometry, or used as a cookie cutter. Arch shape path for sweeping geometry to create 3D arches; e.g. using Arch-E’s Poly Sweep tool. Template to drive boolean tools for cutting arch shapes into existing geometry (cookie cutter). Starting point for creating moulding profiles (e,g. cyma recta). 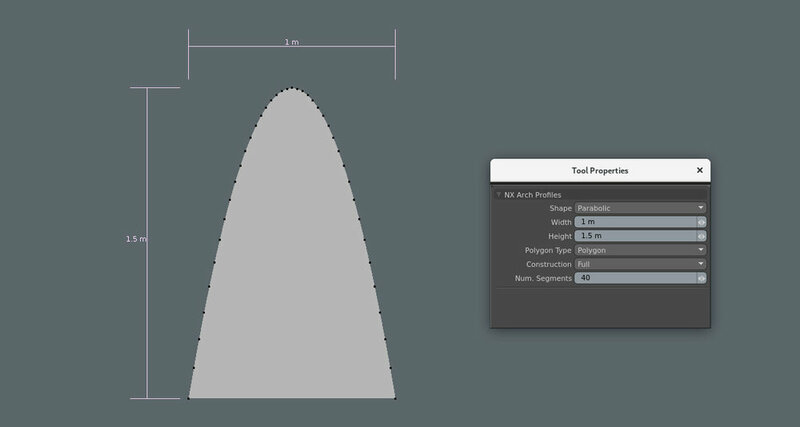 As a polyline profile for use with modo’s built-in Radial Sweep tool to create 3D arch-derived shapes. Generates material masks (group and material) for each of the polygon part-names within your scene, whilst avoiding duplication of pre-existing part-type masks. Automagically creating part-type material masks in a single click. Create materials for all the parts produced by the Door Template tool, for example, in a single click. An experimental tool that takes the hard work out of dividing up polygons when forming a panel-door. This interactive tool creates a contiguous 2D mesh of polygons ready for extrusion and bevelling in modo.. Creating a panel-door layout ready for extrusion and bevelling. Can be used as a starting point for many door layouts; e.g. you can simply merge various groups of polygons prior to extrusion. A highly adjustable tool for creating double-hung window designs for use with your buildings and interior scenes. 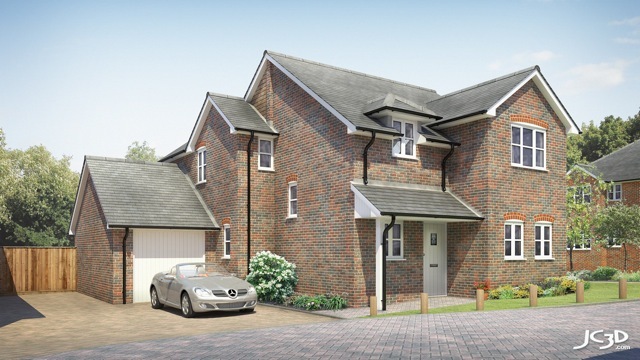 Ideal for arch-viz, interior visualisations and set extensions. 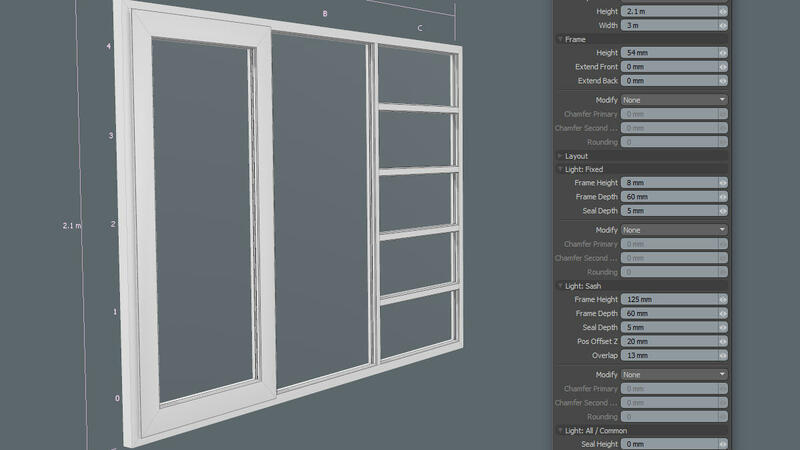 A specialist tool for creating horizontal sliding windows and doors with a ton of tweak-able attributes. 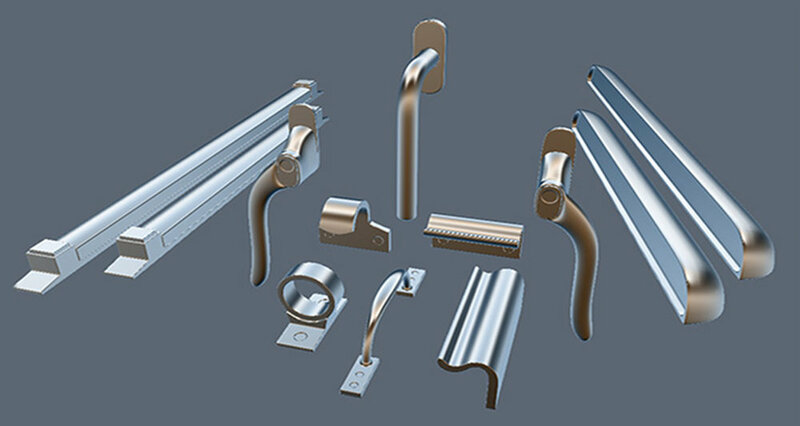 Contemporary (Alu) sliding windows and doors. Generates material masks specifcailly for each of the polygon part names created by the window maker plugins. This spares you from having to creating the masks and materials by hand. Furthermore, once these have been created, modo will apply use these materials whilst the window generator tools are active. Automatically generating material groups/masks for each part (polygon part name) of the window. 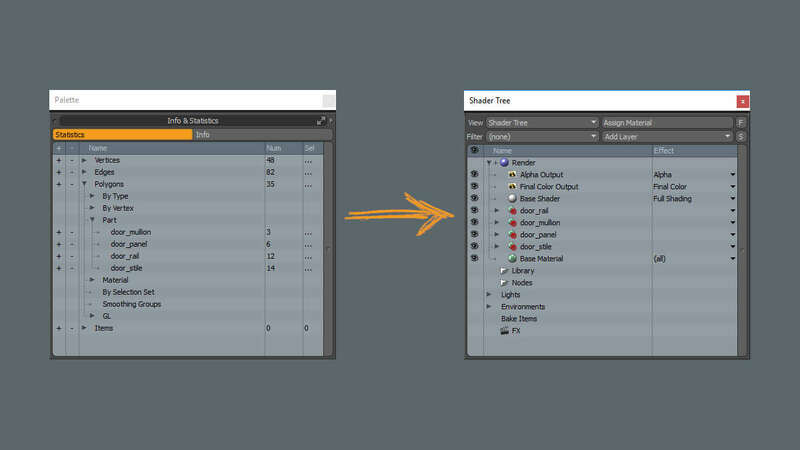 Enables modo to show materials whilst MultiWindow, Box Sash and Horizontal Sliders tools are active. This command will add, orientate and position a new locator at the point where the two selected edges meet. It is highly specialised towards this single task and will only correctly orientate the locator when the correct edges are chosen. Creating locators at the corner of a window or door reveal. Aligning windows to window openings. A set of window furniture mesh presets for use with modo; These are sub-d (designed for sub-division smoothing) models. Adding extra layer of detail and realism to windows. Use as base to create your own handle or vent variations. Create compelling casement, fixed-light, double-hung and slider window geometry for use with your 3D buildings (arch-viz, digital set extensions, games) using this professional and fun to use plugin for modo. 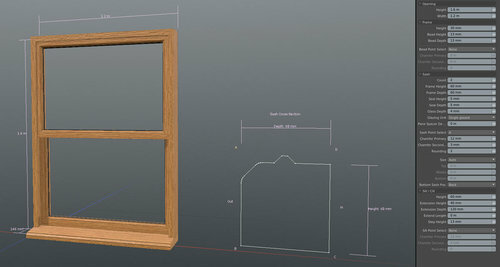 Then, add an extra degree of realism using the included 3D window furniture models (handles, pulls and vents). 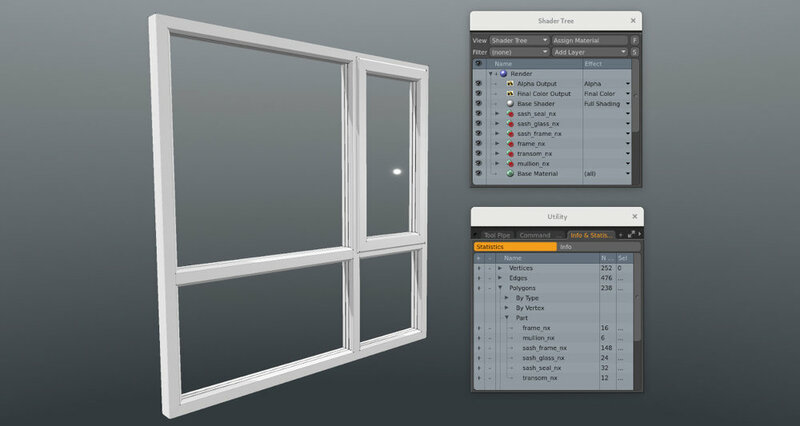 The Window Maker Kit is designed to be easy to use and the underlying procedural nature of the tools makes them highly adjustable, which gives you with an enormous amount of creative control over the layout and appearance of the windows. Detail where it matters - apply extra detail (e.g. chamfers) just where you need it. Easy selection and texturing - polygon part names and UVs are automatically generated. And UV scaling is consistent across all three tools. Fast Alignment - use the 'Add Locator To Corner' command to aid easy fitting of the windows. Reduce visual clutter - the user interface for each tool is divided into logical sections, which can be individually collapsed. This plugin requires a copy of modo 10, modo 11, modo 12 or modo 13 series to be installed1. An internet connection is required to access the User Manual. 1Please note that we cannot guarantee support for beta versions of modo and updates to modo may require plugin updates. 2The Linux version of the kit has been tested with Arch Linux and Ubuntu 18.04. If you can run one of the required versions of modo on your Linux distro, then the kit should be fine; Linux is my primary development environment for modo plugins. The tools are primary designed for use with modo’s (default) Y-up world axis, however, many support all up-axis orientations; Those that don't will create geometry aligned along the X and Y axes. Generated UVs are stacked and proportional, but they are neither packed nor normalized to fit in the 0-to-1 space. Hence, pack and paint (if required) is left to the artist. Materials are not created, but polygon part names are generated (same across all tools) to enable easy selection and material/group assignment. 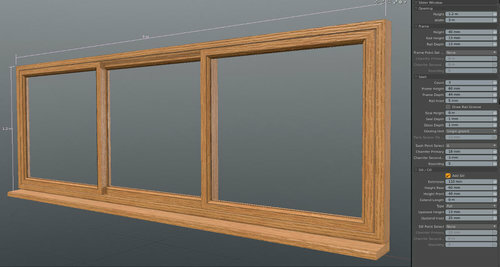 Note: The Window Maker Kit has a special plugin/command that automagically creates materials for all the window parts. Price is for a single-user license ("single seat") of the Arch Essentials Kit (a.k.a. "Arch-E"). Price excludes VAT where applicable (e.g. Europe). By clicking on the Gumroad link above you are agreeing to our Terms And Conditions including the EULA. My very occasional newsletter will keep you in-the-loop about forthcoming tools and plugins, special offers, free content and videos.